The history of curling in Canada extends back to the origins of this country's earliest European immigrants. It is an important history that reflects Canada's social and cultural development. Bonspiel! The History of Curling in Canada tells the story of curling from its distant origins to its current popularity. Library and Archives Canada holds one of the richest collections of documents on curling in Canada, acquired from various regional, national, and international curling bodies. In Bonspiel!, selections from these records are united under the theme of playing and enjoying the unofficial national sport of curling. Bonspiel!explores the history and cultural impact of curling from the sport's mysterious 16th-century origins to the present day. The story of curling in Canada is interpreted under chronological themes that relate the history of curling to the playing surface of the game itself. All of the images and documents digitized for this site are available in the Bonspiel Image Gallery. This site uses digitized collection material from Library and Archives Canada to trace the development of curling from its earliest origins in Canada to its present form. Each section of the site is named after a part of the playing surface. The Hack (1500-1800) examines the controversial origins of curling and explores its foothold in British North America. The Hogline (1760-1850) looks at the early development of the sport as it crossed into Canada. The House (after 1850) explores the development of curling as a Canadian sport and how it shaped, and was shaped by, Canadian culture. Burned Stones: Curling Lore highlights interesting stories and personalities that are hallmarks of the sport in Canada. Some of the original materials that have been digitized include minute books, constitutional documents, letters, documentary artworks and photographs. In the following activities, students will read about the history of curling, which forms an important part of Canadian culture and history. They will use primary documents downloaded from the Library and Archives Canada virtual exhibition Bonspiel: The History of Curling in Canada. Cox, Allan Elton. A History of Sports in Canada, 1868-1900 [microform]. Doctoral Dissertation, University of Alberta, 1969. Ottawa: National Library of Canada, 1970. Curl BC. The History of Curling in British Columbia: 100 Years of Curling, 1895-1995. Vancouver: Curl British Columbia, 1995. Garcelon, Alan O. New Brunswick Curling Records: A Compilation of Records Outlining the Development and Growth of the Sport Throughout the Province: 1854-1993. Third edition. [Fredericton? ]: New Brunswick Curling Association, 1993. Hall, M. Ann. A History of Women's Sports in Canada, Prior to World War 1. M.A. Thesis: University of Alberta, 1968. Edmonton: University of Alberta, 1968. Hansen, Warren. Curling: The History, The Players, The Game. Toronto: Key Porter Books, 1999. Kerr, John. 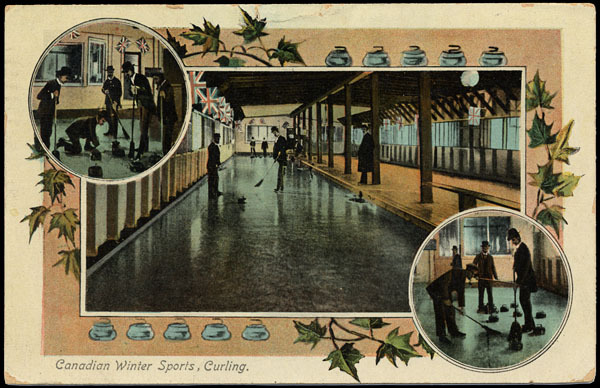 Curling in Canada and the United States: A Record of the Tour of the Scottish Team, 1902-3, and of the Game in the Dominion and the Republic. Edinburgh: G.A. Morton; Toronto: Toronto News Company, 1904. History of Curling: Scotland's Ain Game, and Fifty Years of the Royal Caledonian Curling Club. Edinburgh: Published under authority of the Club by D. Douglas, 1890. Maxwell, Douglas. Canada Curls: The Illustrated History of Curling in Canada. North Vancouver, British Columbia: Whitecap Books, 2002. Murray, W.H. The Curling Companion. Revised edition. Toronto: Collins, 1982. Pezer, Vera. The Stone Age: A Social History of Curling on the Prairies. Calgary: Fifth House, 2003. Redmond, Gerald. "Curling." The Canadian Encyclopedia. Second edition. Edmonton: Hurtig Publishers, 1988, P. 555-556. The Scots and Sport in Nineteenth Century Canada. Doctoral Dissertation, University of Alberta, 1972. Ottawa: Cataloguing Branch, National Library of Canada, 1973. Russell, Scott. Open House: Canada and the Magic of Curling. Toronto: Anchor Canada, 2004. Smith, David B. Curling: An Illustrated History. Edinburgh: Donald, 1981. Stevenson, John A. Curling in Ontario, 1846-1946. Toronto: Ontario Curling Association, 1950.